To outsource or not to outsource? That is the question! 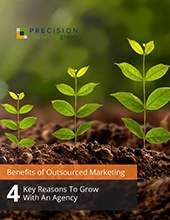 Our free cheat sheet highlights the 4 major advantages – Find out the ways working with an outsourced marketing team could boost your business. We know outsourced marketing services aren’t for everyone. However, some business owners are just a little unsure of how useful they can be! Sometimes it’s just a matter of understanding how outsourced marketing can have a positive impact on your business. How could working with an outsourced marketing team give your business the boost it needs? Simply fill out the form to get your free cheat sheet now!